Two UMass Amherst police officers deploy tear gas on UMass Amherst students and people rallying and rioting in the Southwest living area of the UMass Amherst campus on Sunday. 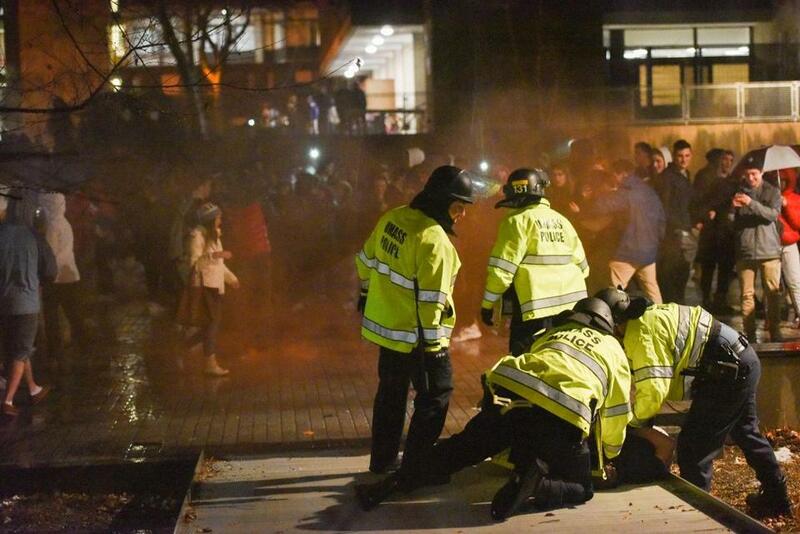 University of Massachusetts Amherst police are pursuing criminal charges after a rowdy post-Super Bowl gathering of 2,000 people ended with seven arrests and a number of injuries Sunday night, officials said. The university will also initiate a review of the incident based on its student conduct process. People began arriving at the university’s Southwest Residential Area shortly after the New England Patriots’ 41-33 loss to the Philadelphia Eagles at 10:17 p.m., university spokesman Ed Blaguszewski said in a statement. Fights quickly broke out, and the crowd began throwing objects and setting off smoke bombs and firecrackers, prompting police to use pepper spray to clear the area, Blaguszewski said. By 11:30 p.m., the scene was cleared. Medical calls included head injuries, lacerations, and alcohol intoxication, and the Amherst Fire Department’s ambulances took 12 people for treatment, Blaguszewski said. Officials reported that approximately $2,685 in damages was made to residence halls in the Southwest Residential area. A Umass Amherst spokesman said the damage was mostly confined to the bathrooms and included removed soap and toilet paper dispensers, damaged door vents, and a shattered toilet. One student, 22-year-old Jordan E. Ortiz, was arraigned on disorderly conduct, rioting, and failing to disperse charges in Belchertown’s Eastern Hampshire District Court on Monday morning. The other six people who were arrested will be arraigned in the same court on Tuesday. The charges against them have not been released. Elise Takahama can be reached at elise.takahama@globe.com. Alejandro Serrano can be reached at alejandro.serrano@globe.com. J.D. Capelouto can be reached at jd.capelouto@globe.com. Abigail Feldman contributed to this article.